This Ramazan I decided to try my hand at making Wontons. I had bookmarked this recipe a long time back from this Desi blog that I follow titled "Hunger & Haw Hai". The recipe itself was totally my style since it featured one of my favourite Chinese dishes as the basis of the filling. Unfortunately, all my dreams of my wontons looking similar to the stunning photographs of the original recipe failed. The wonton sheets that I had gotten from a local bakery were not the right size when I cut them into smaller pieces, and it took me about 2-3 minutes to just be able to make that twisty wonton effect for just 1 wonton and I was worried about the size being too small so the filling would leak out. Looking at the clock, and the amount of wrappers in front of me, I was about to lose hope thinking that I was going to spend my entire afternoon twisting wonton wrappers. 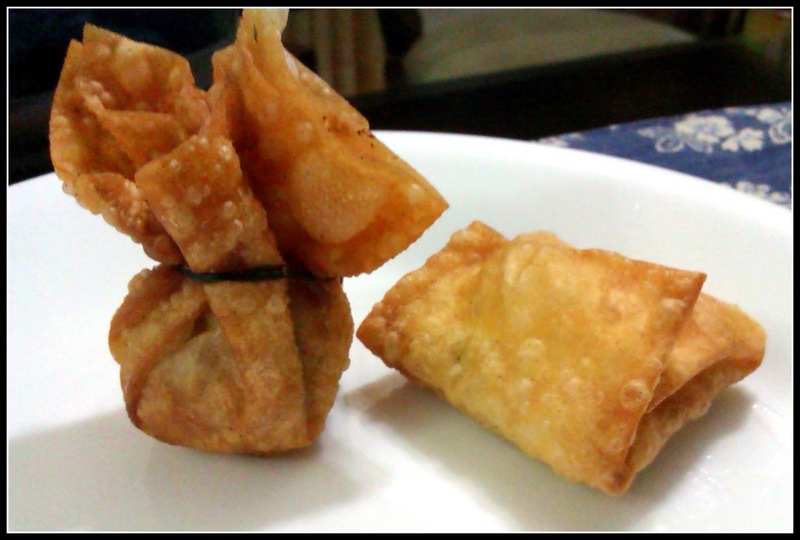 BUT, then I did a little bit of wrapping and folding, and I turned the wontons into small little parcels. So from Wontons, this recipe shifted to Kung Pao Chicken Parcels. Taste-wise, the wontons were delicious with the minced chicken & peanuts filling providing a welcome change from the usual Samosa's & Spring Roll filling. Looks-wise, the real wontons definitely looked prettier with the spring roll knot in a way just completing the package. But the square little parcels that I made looked quite nice too, and I am sure if anyone didn't know they were originally wontons, they could just as easily be called Kung Pao Chicken Parcels! The point is that sometimes we have to adapt and change our recipe a little here and there if something goes wrong, but as long as the ingredients are delicious, the end result will also be just as good :)! 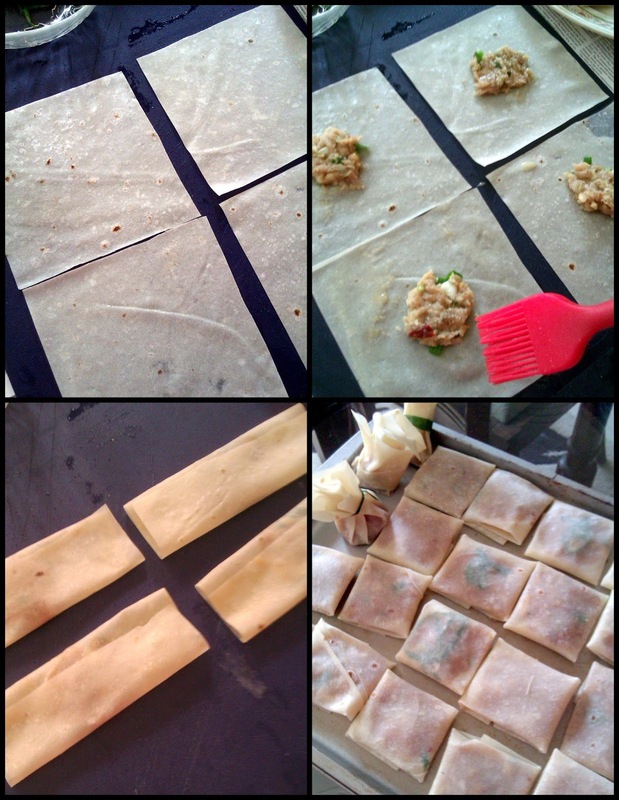 Have included the recipe for both wontons and parcels, so you can make whatever you want depending on the wrappers you have! -For the wonton filling, in a large bowl, combine the chicken, soy sauce, oyster sauce, sesame oil, sugar, salt, pepper, peanuts, spring onions, ginger, garlic, and dried chili flakes. - Put a piece of wilted spring onion in on top of the filling (had to subsitute since I couldn't tie the ribbon). After brushing the egg wash around the filling (I find that a silicon pastry brush is the best for this job), divide the wrapper into thirds bring the left and the right side of the wrapper in the middle over the filling. Brush a little more egg wash on the right and left side of the now rectangular wrapper. Bring both ends together in the middle, making sure that the package is all sealed. Voila, square little parcels ready! - Heat the oil and fry the wontons/parcels in batches, until golden and crisp from both sides, approximately 2-3 minutes. - Serve hot with Chilli Sauce.